The Sunday New York Times showed a familiar face in their wedding section today. The Times was featuring the marriage of two theatre actors - Katie Finneran and Daniel Goldstein. The couple were first married on August 16 with a civil ceremony at the Manhattan Marriage Bureau, which was followed by a second ceremony at Trattoria Cinque in TriBeCa on August 22. The 135 guests who joined them at the Sunday event were primarily family members and close friends, including Peter. The Times read, "Mr. Coyote, who is training to become a Buddhist priest, and who wore a long black clerical robe, presided over Sunday’s celebration. He spoke about the responsibilities each partner in the marriage had to each other and their community, and how this bond required them to put 'the other first, to sublimate the selfish impulse of the moment.' It is 'this selflessness,' he said, that 'separates marriage from all other institutions, except maybe parenthood.'" Peter co-starred with Ms. Finneran in the 2005 "The Inside" television series, and it's not the first time he's officiated at a co-star's wedding. 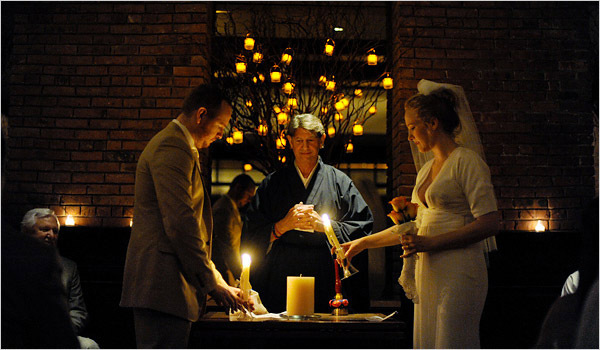 In May of 2009, he presided over the marriage of Bebe Neuwirth ("Adopt a Sailor"). 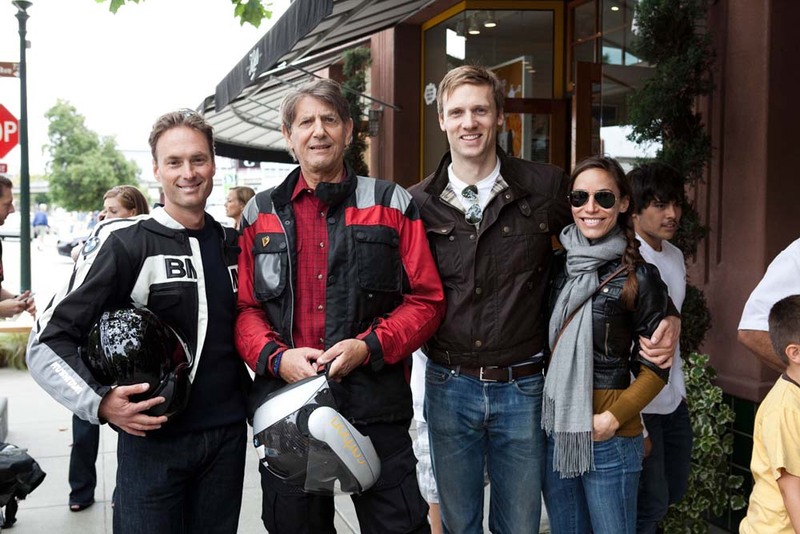 Peter was among the 20 motorcyle-riding celebrities who took part in Kiehl's LifeRide, a unique event that supports research in finding a cure for HIV and AIDS. The ride from San Diego to San Francisco from August 2-7 was led by Chris Salgardo, president of Kiehl's USA, and Alain de Cadenet, Le Mans racer and TV motorsport host. Salgardo presented $85,000 to the CEO of amfAR at the end of the ride. 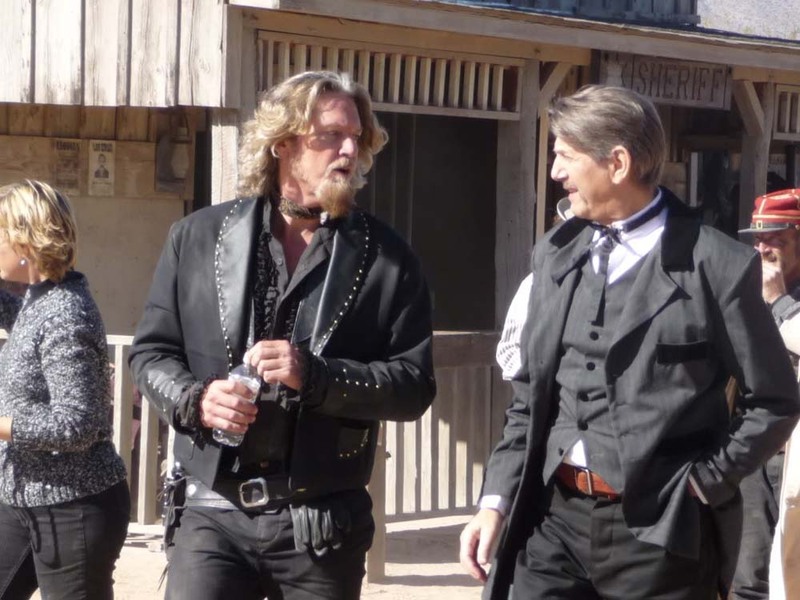 Other celebrity riders included William H. Macy and Fred Durst. The photo above shows Peter with Jared Zaugg, Teddy Sears and Milissa Skoro. I've previously posted about a film called THE HARIMAYA BRIDGE, in which Peter has a cameo. It's the story of an African-American man who travels to rural Japan to claim personal items that belonged to his late estranged son, and is now presently playing at the Presidio Theatre in San Francisco and in Berkeley at the Oaks Theatre. It has previously been screened at several film festivals, including the Pan Africa Film & Arts Festival, where Aaron Woolfolk received a director's award. Woolfolk wrote the script drawing on his experience as an English teacher in the JET exchange program in Japan. With the support of Danny Glover (Glover is Executive Producer of the movie and also makes a cameo appearance), Woolfolk has created a successful first feature. 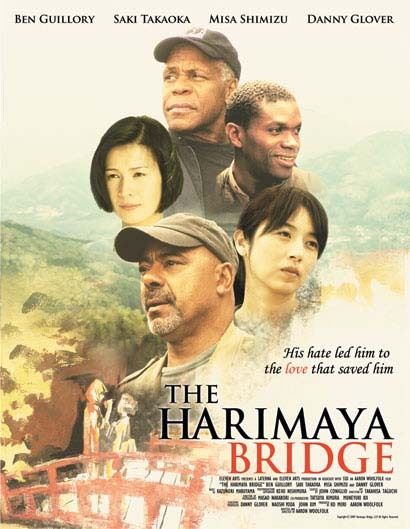 Praise comes from Asian Week - "The brave, inspiring, and unique journey of the characters in The Harimaya Bridge is more than just a portrayal of the trials and tribulations of east meets west – it is a true testament of the individual will to persevere in the face of discrimination. Yet, despite the wall of discrimination, Woolfolk ends the film on the force that can hold all of humanity together – love." 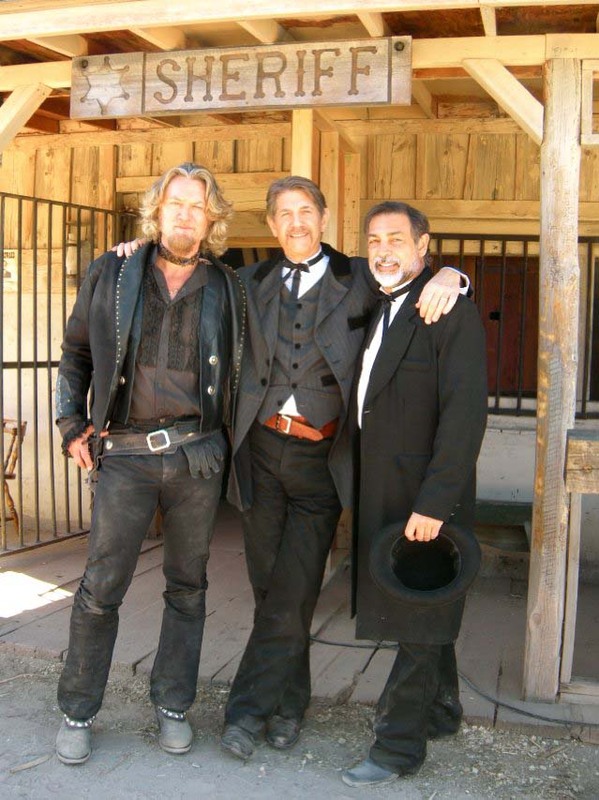 I just came across these new on-location photos from the film, THE GUNDOWN, shot last December near Benson, Arizona. 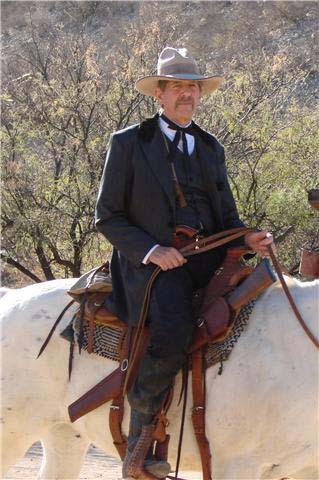 Coyote always looks good in western garb! The first couple photos shows him standing with his long-haired co-star, William Shockley, who also co-wrote the screenplay. Peter is presently in Madrid on a publicity tour for DI DI HOLLYWOOD. According to Variety, Spanish pubcasters TVE and TV3 and Gallic paybox Canal Plus have nabbed TV rights. I'm also happy to report that he has just finished recording a new audiobook called "The Fifth Agreement" by Don Miguel Ruiz. Peter previously recorded "Four Agreements" by Amber-Allen Publishers back in 2003. Note: There will be no updates until August 1. 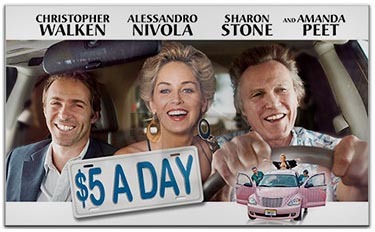 Image Entertainment will finally release the Nigel Cole film “$5 A DAY” on DVD and Blu-ray on August 24th. The title had previously been scheduled for release back in January but was put on hold. Christopher Walken plays an eccentric conman - a hustler content with a life of schemes and underhanded deals. He lacks one thing: a reconciliation with his son Flynn, played by Alessandro Nivola. With a supporting cast that includes Peter, Sharon Stone and Amanda Peet, this comedy will be a happy reminder that relationships may take their toll, but what e get in return is priceless.